You can watch a video of making pasta right on this page. You can roll out your pasta with a rolling pin. Then use a pizza wheel to cut it to your desired size. I prefer to use a pasta machine. The pasta machine will allow you to make you pasta the desired thickness. 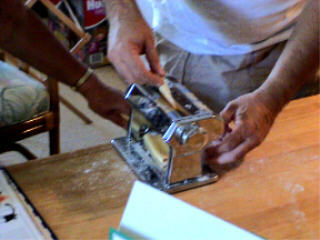 In addition as you run the dough through the machine it will also knead the pasta. Put the pasta machine on the widest setting. Continue to pass the pasta through the machine, changing the setting each time. When the past reaches your desired thickness, your done. Place the pasta sheets on a dish towel or between dusted sheets of wax paper. Careful to not let the pasta dry out. Now you can either run the pasta sheets through a the pasta machine to cut it into noodles or you can use a pasta wheel or pizza wheel, if you are making lasagna. You must respond to verification email to be on this list.